Kirkhope and I had this conversation last week in a borrowed meeting room at the Los Angeles Convention Center, several yards away from thunderous booths for Capcom, Activision and EA. Next to him, a TV was running an early build of Yooka-Laylee, the spiritual successor to Banjo-Kazooie that—screw the doubters—he and a growing team (seven so far) at indie studio Playtonic are making. We were talking on the day after the Kickstarter for Yooka-Laylee ended. Playtonic had asked for $270,000—less than they needed, admittedly, but enough to pool with personal investments to confirm there was interest. Fans gave them that much in 40 minutes. By the end of the Kickstarter, a month later, they had made $3,286,082 from more than 73,000 backers. “I got something right for once,” Kirkhope said. Video of Yooka-Laylee’s E3 build that was posted to YouTube by the folks at GamExplain certainly shows a game that looks and sounds like a successor to the great Banjo games. It’s a third-person game involving running, jumping, enemy-smashing and item collecting, starring one colorful character who rides on the back of the other. It’s not quite a bird riding in a bear’s backpack, but it’s close. Yooka is a lizard. Laylee is a bat. There is zero coincidence about this. Playtonic is staffed by developers who worked together at the legendary game studio Rare, and most of them worked together on previous Banjo-Kazooie games. The game’s project director was credited, third-from-top-billing, as Banjo-Kazooie’s “chief keyboard tapper” (read: lead programmer) and also did the voices for the title characters, as he is now doing for the heroes of this new adventure. Steve Mayles, character art director on this new game, was the “chief scribbler” and character designer for BK. Steve Hurst was BK’s “scene crayoner” and is now the guy creating worlds in Yooka-Laylee. Kirkhope was the N64 game’s composer. And so on. “’A witch?’” Kirkhope chimed in, referencing Banjo baddie Gruntilda. Banjo was funny, too, with characters regularly mouthing off at each other. Kirkhope says the Playtonic crew is already having plenty of laughs internally, so presumably that’ll seep into the new game. Banjo-Kazooie came out in 1998. It itself was seen as a spiritual successor to the pioneering Nintendo 64 launch game Super Mario 64, two years its senior. The Mario game started a generation of 3D platformers as game designers learned from its lessons and adapted the level design ideas of two prior generations of sidescrolling run/jump/attack platforming games into three dimensional gameplay. There may well have been more 3D platformers on the N64/PlayStation generation of consoles than there were, say, first-person shooters, but the former genre is, no pun intended, a rarity these days. Nintendo has reverted to channeling most of its platforming designs into 2D games. Rare spent its recent years making casual sports games. Even Nintendo’s 3D Mario releases have been funneled into designs that are, at best, a compromise between full 3D design and 2D. The Rare guys themselves had seemed to tire of the 3D platformer pretty quickly, certainly of the Banjo rendition of them, Kirkhope recalled. “I think with Tooie we were tired of it at that point,” he said referring to 2000’s Banjo-Tooie. “We’d done two games, and, if you do continual sequels—Rare didn’t like to do that—we didn’t want to do another Banjo game. And that’s why it kind of ended there.” Many on the team went on to make Donkey Kong 64, but that was about it for 3D platformers at Rare. There are many possible reasons for the demise of 3D platformers more than a decade ago. One theory: the genre gorged itself on its own gameplay. Kirkhope admits that Tooie, for example, simply had levels that were too large. More problematic was all the stuff people were asked to fetch in these games. Rare’s 3D platformers in particular were notorious for being loaded with items to hoard, a nightmare mutation of the relatively reserved coin-collecting in Super Mario or even the charming-if-pushing-it collecting of items in the first Banjo. 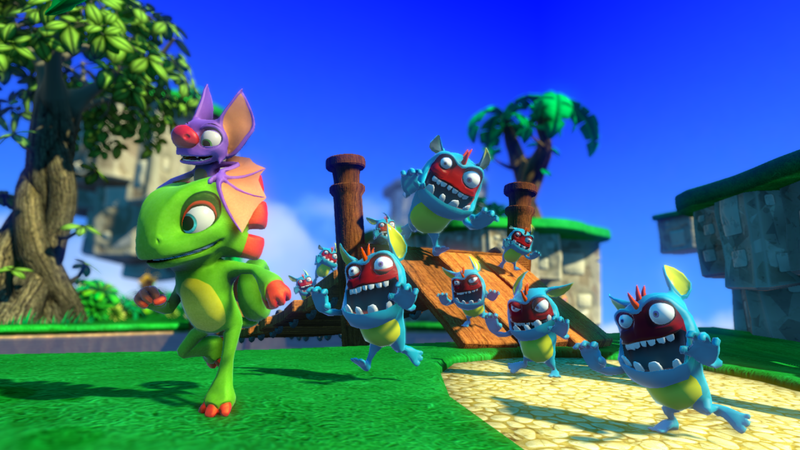 Robinson promised that Playtonic will contain level-sprawl in their new platformers as well by initially introducing smaller levels to Yooka-Laylee players and having those levels expand as the player explores them.